Tiajuan Walker threw well enough to beat the White Sox, but the Mariners couldn’t capitalize on their offensive chances, going 0-for-7 with runners in scoring position. Had it not been for Taijuan Walker’s sudden spurt of wildness in the fourth inning, and 1B Adam Lind’s double-play ball in the seventh, the Mariners might have earned a split of their four-game series Sunday at U.S. Cellular Field (box). Instead, the Chicago White Sox nursed a 2-1 lead until the eighth when they aded two more runs for a 4-1 victory, handing Seattle its fifth loss in six games. Coupled with Baltimore’s 5-0 triumph over the New York Yankees in the Bronx, the Mariners (68-62) fell three games behind the Orioles in their pursuit of the second wild card slot. Walker threw no-hit ball through three innings, but allowed two hits and hit two batters (Adam Eaton and Jose Abreu) in the fourth, leading to a pair of White Sox runs. Seattle took one back in the sixth on 2B Robinson Cano’s 30th home run, and had a chance to do major damage in the seventh when 3B Kyle Seager opened with a single to shallow right. RF Franklin Gutierrez followed Seager with a knock to left and, after Chris Beck relieved Chicago starter Carlos Rodon, C Mike Zunino sacrificed, giving Seattle runners at the corners with one out. Lind pinch hit for 1B Dae-Ho Lee, but bounced into a double play that ended the Mariners’ biggest threat until the ninth, when two more were aboard with none out and couldn’t capitalize. The Mariners collected seven hits, five off starter Carlos Rodon . . . Cano went 2-for-4 and Seager collected three hits (3-for-4), including his third triple of the season . 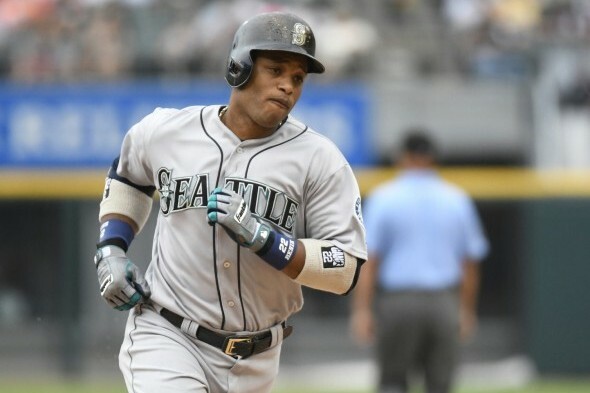 . . Cano needs one more double to reach 30 homers and 30 doubles . . . Gutierrez also had a two-hit day . . . The Mariners went 0-for-7 with runners in scoring position and stranded six. They entered the game with a .325 batting average with RISP since Aug. 1, the best mark in the majors (Seager led off the second with a triple, but the Mariners couldn’t plate him). Walker (4-9, 4.19) allowed only four hits, but the White Sox maxed them out, scoring four earned runs over Walker’s 7.1 innings. Walker generally pitched well, but the two hit batters in the fourth hurt, as did Melky Cabrera’s run-scoring triple in the eighth. Walker, who hit three batters, hasn’t won since June 30 vs. Baltimore . . . New call-up Danny Altavilla replaced Walker in the eighth and recorded one strikeout in two-thirds of an inning. The Mariners fell to 14-17 against the AL Central and to 3-4 vs. the White Sox . . . The Mariners are 16-11 in August and need one more victory to tie their monthly high in wins, 17 in May . . . By losing three of four at U.S. Cellular Field, the Mariners fell to 20-14-8 in overall series. The Mariners begin a three-game set at AL West leader Texas Monday at 5:05 p.m. PT. RHP Hisashi Iwakuma (14-9, 3.81) will oppose RHP Yu Darvish (4-3, 2.91). Texas leads the season series 8-4. The Mariners are off Thursday and will begin a three-game series against the L.A. Angels Friday at Safeco Field.